Disposable Diapers from Simple Solution offer no-leak protection for a secure, comfortable fit. Each diaper absorbs wetness and eliminates messes from excitable urination, incontinence, male marking or for puppies that are not yet housetrained. Each diaper features an adjusting elastic tail hole, re-sealable closures and a comfort leg fit. 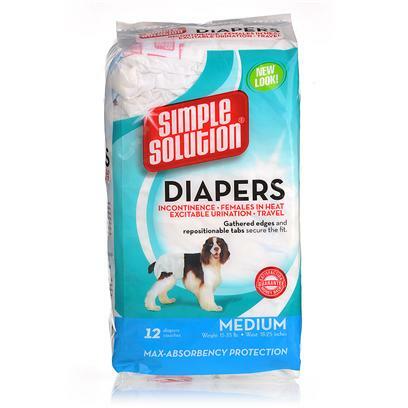 New Disposable Diapers from Simple Solution offer no leak protection for a secure, comfortable fit. Each diaper absorbs wetness and eliminates messes from excitable urination, incontinence, male marking or for puppies that are not yet housetrained. Each diaper features an adjusting elastic tail hole, re-sealable closures and a comfort leg fit.